Carp, Jesse. “Arrested Development Gallery.” Movie Blend. July 28, 2012. The return of the cult classic television series, Arrested Development, in an online format will change the future of the industry and transform the way we consume media. The image above shows a tattered “Frozen Banana” stand apparently owned by someone with the name of “Bluth.” The stand has “closed” sign displayed over its window. The stand looks as though it has been abandoned for some time. 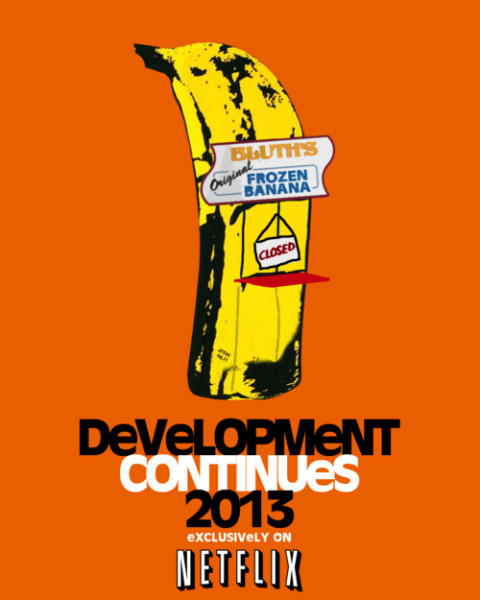 The text below the stand read: “Development continues 2013 exclusively on Netflix.” The text is colored black and white, in contrast to the bright orange background. To a person viewing this image with a significant knowledge of pop-culture this image means a lot. The image refers to the cult classic television series “Arrested Development,” which came to an end after only three seasons. Despite the critical acclaim and Emmy Awards that the show earned during its short run it could never manage to pull in enough viewers to convince the network to keep the show running. However, after its cancellation the show became a huge success and is now one of the most beloved sitcoms of all time, spawning countless internet campaigns to bring the show back in some form and even a documentary about its run. In 2011 the hard work of the fans finally paid off when it was announced that Netflix would pick up the show for a long-awaited fourth season. The image above is the first ad for the return of the show recently released by Netflix. The banana stand, owned by the dysfunctional Bluth family, was a common location in show, and its poor state shown on the poster references the years that the beloved sitcom has been gone. Perhaps the most important part of the poster is the text “…exclusively on Netflix.” The fact that immensely popular show will be available online could potentially change the television industry dramatically. With more and more people already looking towards the internet for television content on websites like Hulu and Netflix, this push for original online content with a show that already has a built in fan base could make online television the next big thing. If season four of Arrested Development is a success, it could change the way people consume media in the future and popularize online television even more. The exciting return of Arrested Development may bring about a shift in the television industry towards more exclusive online content. This spring Netflix will release 13 new episodes of the cult classic television show, marking the first time a show with such a fan base will be revived on the internet. News of the show has already increased Netflix subscribers, indicating that this new way of releasing exclusive content could mark the beginning of a new era of television.